Cream cheese, salsa and chili beans are topped with melted cheese to create this warm dip that will have everyone lining up for seconds. Combine cream cheese and salsa and spread in bottom of 9-inch pie plate. 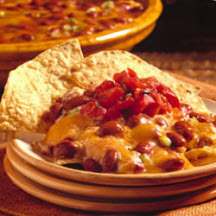 Spread chili beans over shredded cheese. Top with remaining shredded cheese, sliced green onions and olives. Bake for 15 minutes until mixture is thoroughly heated and cheese is melted.